As many eager writers start on their path to become freelance writers and start their own business, it seems to me that many often think too much or rethink this decision based on the fact that they do not see the "perks" of this job. One of the things that turns most freelancers away from being full time writers is having to invest the time to do the proper research, having time to write and having time actually start making connections in all of the right places. 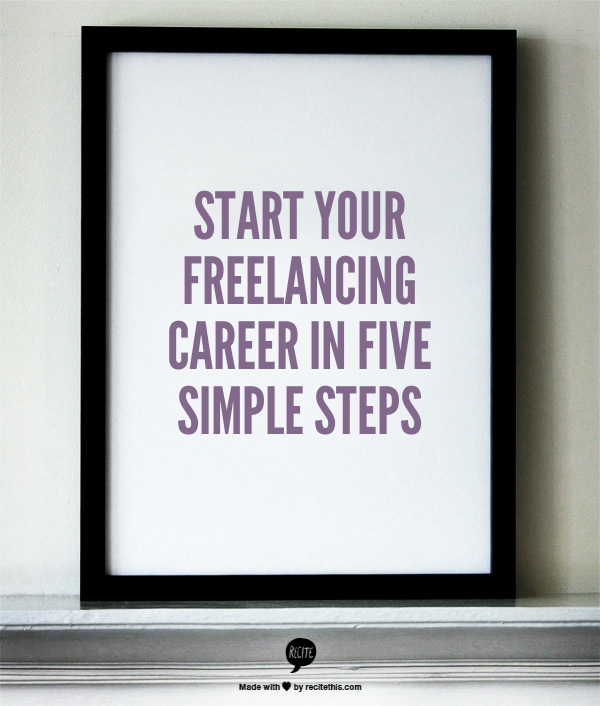 Here are five simple ways that freelancers can start their career and making money! In the beginning of any career, most people find out that all they do is work but not make any "real" money. Making small amounts of money is quite simple, especially for any writer, but there comes a time, when most people want to see themselves making at least a two or three thousand dollars a month for their hard work. I have been one of those writers that have gotten so lost in between multiple searches and information that I really did not know that starting my freelance career and/or business is simple and writer do not need to invest too much time reading different versions of the same articles. First of all, before any writer starts they have to think about what do they want to do. Do you want to own your own website or write on your own blog? Do you want to make a little bit of quick money and write on content mills and start your portfolio? In reality, many freelance writers start out just like this: writing on content mills to build their portfolio, however, many of them stop when they choose to chase or apply for other online jobs which will give them more money. This is up to you. Once you set your mind towards what you want to do, just begin to research only those things that are interested in. If you are interested in writing for private clients, then your best bet is to sign up for bidding sites to start looking for good to great jobs. Freelancer.com, E lance and Guru.com, these are great sites to find jobs and they always have jobs for beginners where people actually make a profit! If you are interested in content mills, then you might want to start off in Helium (great money maker), Triond (perfect for beginners), and even Hubpages. This site is harder than the others but once you get started, the money is amazing! If you want to blog for a living then Blogger is your best bet, then there is Wordpress, this is a harder blog to work, at least for me, but I've heard that those that use it have a lot of great experiences with it! Sign up for Adsense and start driving hard traffic to your blog. Marketing helps a ton! 3. If you are already doing these things, then the next step is to just keep on writing. This is a job that if taken seriously it can make you a lot of money. Also, Learn SEO and learn it well. Learn all about the best and highest paying keywords around and put them in your work! This is one of the best ways to make money all the time! 4. Make a work schedule and stick to it! This is perhaps one of the most important parts about being a writer. Although we can work from home, this job is not easy, can be demanding but this can also mean we can be distracted easily! 5. Finally and the most important part of all, make sure you put yourself out there! The most important part about being a freelancer is being able to connect with other people and being able to get people to read and take an interest in our writing. So get out there and start making writing buddies!